Dunhill Flake in a partially rusticated pickaxe by Briar Spirit Pipes. Have been busy running errands and smoked a couple of bowls of tobacco while out. My last smoke was MacBaren Plum Cake in a 1975 medium bend sandblasted looking, smooth on the sides yellow Pioneer meer. Next is Heine's Blend in a 2013 MM straight Legend. Edward G. Robinson's Pipe Blend in the very first pipe I ever smoked (which was my father’s pipe), a late 1950s smooth with etched grooves straight Willard long stem ajustomatic Billiard. BRG in a 1979 Ascorti Business KS Oom Paul. 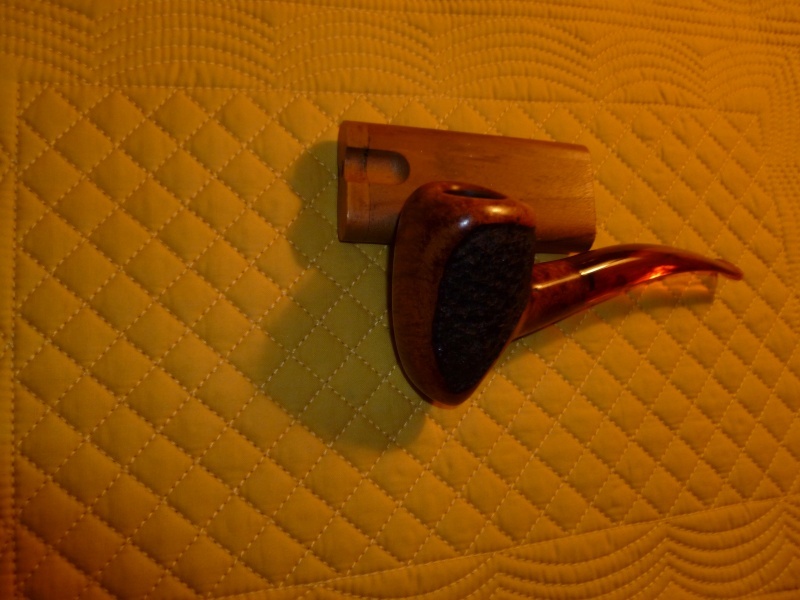 I've been smoking mostly C&D Briar Fox lately ,,, this morning, in a 1957 Dunhill Root Briar EK panel billiard. Listing this a few minutes early: MacBaren Roll Cake in a 1979 black sandblasted medium bend Savinelli Non Pareil 9606 Billiard with a horn ferrule. Autumn Evening in a MM cob. B&B Scott’s Companion in a 1990 smooth medium bend Nording freehand sitter with a wider top than bottom that also has a ridge and a narrower bowl resembling an upside down spout, with an amber colored lucite stem with cream swirls. Blockade Runner in a sandblasted Ser Jacopo bent Dublin. Painter Hills, in a Sav 320. Earlier, it was Sir Walter Raleigh in a medium bend 2002 MM Legend cob. Now, it's Stonehaven in a 1998 smooth medium bend Peterson Limerick 69 with a nickel band. Listing this way early so I can get some house stuff done: G&H Balkan Mixture in a 2003 medium bent Ural meer with a lined and etched egg shaped bowl. 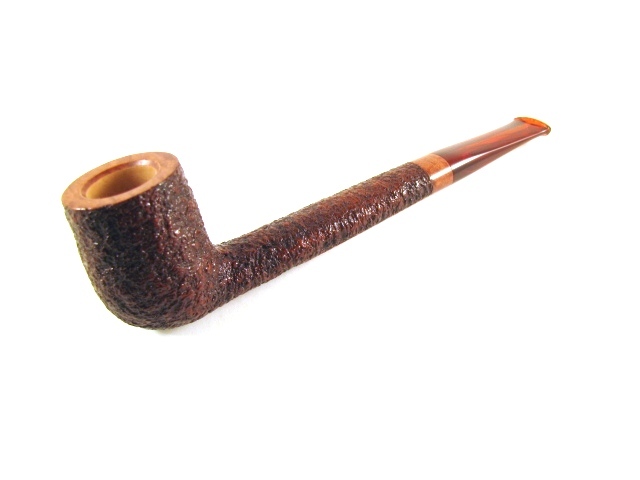 Brown Irish X in an Ashton Brindle sandblasted bent brandy. Sutliff PS Court of St. James in a 1970s smooth medium bend Stanwell Rego 969-48 Design Choice 837 sitter with a vulcanite stem and ferrule. Yenidje Supreme in a Peterson Standard System 302. Anniversary Kake in a smooth 1979 Chippendale (Charatan second) Rhodesian 49. Jim's Burley #1 in a 1980 three quarter bend long stem Ascorti New Dear KS egg. Dunhill Elizabethan Match in a 2003 smooth medium bent straight grain Ardor Venere Extra signed by Dorelio Rovera Dublin. Dutch Masters Whiskey Cavendish in a 2013 slight bend grain etched briar Rekamepip Volcano with a walnut shank. Scotch Flake in a Sasieni 4-dot Ruff Root sanblasted Dublin. Brothers of Briar :: Pipes & Tobacco :: What Are You Smoking Right Now?